Adrian who has provided talks at Waverley dowsers in recent years on his popular book ‘Heal Your Home’ returns to talk about something close to his heart and lends from his tours and walkabouts at the many Sacred and Holy sites visted in his latest book ‘Spirit & Earth’. Adrian will be sharing his knowledge and experiences at Waverley dowsers Unitarian hall in Godalming on the 8th March 2019, the doors open at 7pm for a start at 7.30pm. He will bring along his books and DVD’s which he will be happy to sign for you. So what makes a site Holy and is that actually different from a Sacred Place? We cannot know for sure what our ancestors were truly thinking when they built Avebury and Stonehenge but what we do know is that they were and still are important worship sites. So, was the siting of these monuments to do with the pre-existing energy patterns or for some other reason? What was considered the first Sacred Site or Holy Place, and what makes them so? How strong a part does human emotion and intent play in all this? What influence does Mother Nature and her Elementals have at these sites? Are spirits more active at these sacred sites and how do we deal with them? What was the very first Sacred Space and the first Holy Site? During his talk Adrian will hopefully answer these and many other interesting questions. Adrian is a former Vice President of the British Society of Dowsers, past chair of their Earth Energies Group and Dowsing for Health Group. He is well known for his talks, workshops and courses on dowsing related subjects. He is an author and film maker, his DVD ‘Intuition’, his books ‘Heal Your Home’, (described as the bible of geopathic stress) and co-authored ‘Spirit and Earth’ will be available on the evening. Roger Taylor has been investigating ‘life energies’ for many years, he is a keen follower of the “torsion-field” theory and the the spin of atoms and their secondary energies which can be understood and quantified. With many years of investigation and experimentations with growth enhancement and understanding of Pyramid energy, Roger will be sharing his years of research with Waverley dowsers at the Unitarian Hall on February 8th at 7.30 pm. Below is a short synopsis from Roger on his fascinating talk. Roger will tell how he first began experimenting with dowsing on a small pyramid which took him along to understanding that he was responding to what has been called (among many names) “life energy”. This is now understood to be an influence promoting order, or organisation. Thus it is a syntropic influence – best understood in physics by the Russian “torsion-field” theory. He went on to develop a quantitative method, and identified various sources, and to show how such a syntropic influence would enhance seedling growth, and charge water so that it became dowsable. Later developing a method to dowse entropic influences (such as combustion), and showed that they could and would inhibit seedling growth. A much ignored subject by the mainstream but providing consistent positive results for many investigators in over fifty years of research culminating with the building of the Russian Pyramids. The human body contains upwards of 70 TRILLION cells, depending on who’s estimation you are likely to read, the estimated number goes up each year as science improves. There are also many billions of non-native cells in the human body in our intestines, on our skin and in every orifice you care to point at. Each and every cell respires and excretes waste and each cell also requires energy. All human cells when healthy have an electrical voltage of approx. 22 -25 electron volts (negative electric) which is a very tiny amount of electricity, if the cell has too much electricity or not enough the cell and the organ can become unhealthy. Normally the body regulates the voltage in each cell but if your diet is too acid, or too alkaline then the body can struggle to keep an equilibrium of healthy bio-energy in the body. You can dowse your health by asking the appropriate questions. Other quick ways to balance the body is to find ways to allow the body to dump or discharge the excess electricity, this can be done by walking barefoot outside on grass or even better on a sandy beach for 30 minutes or so and the body will discharge through the soles of the feet, you can feel yourself getting more balanced almost immediately you try this. There are technology tricks available that will do a similar task of discharging excess electricity from the body. You can purchase bed mats that plug into the wall socket, these you would sleep on and the body will discharge through the bed mat while asleep, the electricity will earth through the lead and plug. You can drink lots of water or electrolytic liquids like coconut water, but these methods can also deplete you of essential minerals, so be careful. There is a forum at Britishdowsing.net which welcomes allcomers from around the world to post their dowsing experiences, if you can add to this discussion please visit and join in. Meetings start at 2pm Doors open 1.40pm. GANS plasma is a new alchemical substance.. It has applications in healing, agriculture, power production, and decontamination. Oliver and Malcolm will share the background, key principles, concepts and applications of this technology that is given to mankind by Mr Keshe of the Keshe Foundation. Oliver is an architect and geomancist who now works for Keshe Foundation Global Management Team, helping develop the first factories to get GANS to a wider market. Malcolm is experimenting and sharing the knowledge in many practical ways, and gathering amazing feedback and testimonials. There will also be a ‘plasma cocoon’ in which you can experience the effects of the energy fields emitted by water which has been informed by the GANS substances. It is possible to learn to make it yourself in your home from zinc and copper. Lucy Pringle is a professional aerial photographer, author and lecturer. She is a founder member of the Centre for Crop Circle Studies and is widely known as an international authority on the subject. She is a pioneer researcher into the effects of electromagnetic fields on living systems. Lucy will share with us stories of remarkable experiences she has had during thirty years of researching changes that can happen to people, animals and indeed electrical equipment as a result of spending time inside and in close proximity to crop circles. To put her work in context, Lucy will also explain some of the scientific aspects of her research, the current focus of which is to find temporary relief from the symptoms of Parkinson’s disease. After the tea break, you will have the opportunity to dowse some photos of crop circles. A short snippet of video of Hamish Miller reminds us that being kind and loving to the land brings benefits for all. Well worth listening to his words and the lovely settings. Thank you to Tim Walter for sharing this video. Beyond Colour is a newly inspired vision of Aura-Soma for the time that is to come, to help you hear the message and benefits that Aura-Soma can offer on your journey of self-discovery. Jeanine is an Aura-Soma Colour Care Consultant and registered practitioner. She has been working with Aura-Soma for over 20 years and has used the bottles and essences extensively to support her own journey of inner transformation. The vibrations of the beautiful colours, oils and essences offer a mirror to your soul to bring awareness to your greatest gifts, where you are on your journey and what you need to release to allow your light to shine. Rory Duff who has been dowsing Dragon lines for a number of years and is based at Bristol dowsers has sent out a statement which aligns with what the Wayfinder Wizards have been saying for the last forty years or so, Dragons are important for our health and well being, enjoy Rory’s clarion call. Many people around the World are sensing something different is happening to them. Social media groups like ‘The Event is happening’ are accumulating thousands of followers. Some people are sensing lies more easily and others are even feeling other people’s pain. These all seem to have coincided with a change in the Earth’s energy lines. Since the summer of 2017 the lines have started to get wider. Since January 2018 new galactic energies/ cosmic energies have been getting past our three reducing magnetic shields (The Earths, the Sun’s and the Local Cloud in which our solar system has been moving through). These new incoming energies have led to a new pair of Emperor Dragon Type 5 energy lines appearing on the surface of the Earth. Predictive dowsing suggests that two more pairs are due in 2019. This will give us a total of six pairs of the most powerful of Dragon lines. With the three magnetic shields reducing in strength, research has shown that the increase in cosmic energy is leading to changes to our DNA. These energies are also interacting with the Sun and the Earth’s Iron Nickel inner core which then, in turn, sends out spherical standing waves of very low frequency sound waves. It is this that is driving the increasing widths of these energy lines that we are dowsing on the surface. We know that living on these energy lines can affect us both in positive and negative ways, depending on our own attitude, and we also know that their intersections can be places of great power but now it seems that they are also connected to what some are calling the coming Golden Age. All around the World we find the similar and predominant symbolism of large Snakes, Serpents and Dragons compared to all other animals. The Ouroborus, the Snake that has its tail in its mouth, is found symbolised across cultures and countries. Samples can be found in South America, China, Scandinavia, Egypt, India and Europe. Having looked at the myths and legends that go with these particular symbols it become easy to see their connection to the large earth energy lines that circle our planet. This similarity is also included in some of the well-known prophecies. The Q’ero Inca prophecy talks of galactic energy that emanates across space towards the Earth. It talks of 12 Malku, or Energy workers, that will have all arrived back on Earth, having come though portals or gateways, just before the new Age begins. The Hopi Indian blue Kachina prophecy talks about the new Age beginning seven years after the twins have reappeared on the Earth. The twins are known as the God of the North Pole and the South Pole. The new pair of Emperor Dragon lines that reappeared run from the North to the South Pole and on closer inspection of the prophecy, they could well represent the twins. If this is right we are now in a seven year transition zone. Even the more recent prophecies seem to mirror this connection between snakes and earth energies and the coming new age. Johann Wolfgang von Goethe, the great German writer, statesman and philosopher, wrote a Fairy tale called the Green Snake and the beautiful Lily. A new interpretation of this story shows that the Green Snake is the only one that knows when the prophecy is going to happen. In the story the snake too slides into an Ouroborus shape and is quite clearly a symbol for these energies. Rudolf Steiner, the founder of the Steiner Schools and Anthroposophy, spent many years trying to understand Goethe’s fairy story. He too recognised that a new Epoch was coming and that the Earth’s environment would change again. He went on to say that it would give us the chance again to evolve our consciousness. He talked of a return to a form of Group Soulness. During the last few thousand years we have been experiencing a form of Individual Soulness. This time around Steiner says we are better positioned to take advantage of what is coming. There now appears to be a cyclical nature with the galactic energies getting through to the Earth. Over large timescales the Earth seems to be passing in and out of magnetic regions of Space like the Local Cloud. Now knowing the DNA changing effect that an increase in cosmic energies has on humans, we can perhaps see how Steiner’s different and changing evolutionary Epoch’s could fit with the shielding and non-shielding effect of passing through different regions of magnetic fields in space. A group Soulness, according to Rudolf Steiner, would bring back a group mentality where telepathy and clairvoyance were common place. That may seem great but it appears we would also feel each other’s fears and pain as well. The question now though is what we should do. For that we can look to see what the Earth Energy lines have been teaching us over the last few years. When mapping lines it became apparent that some of the lines had been moved in the past. It was re-discovered by the well-known dowser Hamish Miller that lines could be moved again. This has resulted in understanding what good looks like when the lines are moved to where they wanted to be. This has led to realising that what is important are the intersections and the numbers and types of lines that meet at these places, which are called nodes. These sacred places, or energy intersections, are dynamic in that the energy they contain varies constantly in direction, shape and form. What is really significant though is that they can take on a symmetrical shape. When this happens, or when nodes are repaired so that this is the outcome, we find specific energy shapes occurring just four times a year. It is these four occasions, whilst on their sacred sites, that our ancestors back in the Stone Age, and even in some places the Bronze Age, spent time together in group meditation. The energies on these occasions seem to provide an environment that benefits the human mind and body in many different ways. In many of the prophecies we are told to gather and pray or meditate if we are to benefit and evolve our consciousness. For these reasons it is now thought that we must all pray or meditate in groups again in the lead up to the new Age which now appears to be less than 7 years away if the Hopi Indians have their numbers right. Waverley Dowsers have their own Dragons flowing through the Unitarian hall, so any activity around meditation, Prayer or other heartfelt activities such as Singing or Yoga are hugely beneficial to the Dragons and the Planet and these beautiful heartfelt thoughts will be carried around the globe. Waverley dowsers who have been dowsing Dragon lines at Churches and ancient sacred sites understand the need for Dragons to be highly considered and agree with Rory to connect with Dragons as much as possible. Michael Haxeltine, now in his eighties is trying to reintroduce Dowsing/Radiesthesia into all arms HM forces and at the same time recognising the high tech advancements the armed forces work with. Royal Engineers could make use of an innovative use of the modified Bovis Units Scale/ Gigahertz for assessing quantity of beneficial/harmful effect in the military context. He told me he is trawling for opportunities, in all arms of the armed forces in the UK to give presentations as steps towards reintroducing this mysterious science into the HMF. The subject was taught to royal engineers Officers in the 1960’s who on completion of dowsing training had their service record endorsed as “having the knowledge”. He has spent time searching for any resemblance of a syllabus from the 60s. In the absence of an MoD approved dowsing syllabus he has developed a syllabus; on his own for use by the UK armed forces. I asked him why he is so keen on his self set task. He simply said “ this is to save future fiscal issues and reducing an expenditure on wreaths” a phrase he used in 2005 in a military association journal. That dates the start of his quest. He said that the recent body search in Germany could have been enhanced by a dowsing search using Colonel Bell’s initiative from the early 30’s when he was a founder member of the British Society of Dowsers. He spoke briefly about Colonel Bell RE and his pioneering work on distant “map” dowsing where it is possible to search from a map in the UK for a lost object hundreds or even thousands of miles away. Michael demonstrated to the royal engineers how to complete a dowsing search for something in the southern hemisphere from the UK. Michael encouraged us to use positive map dowsing skills to locate two unsolved murders – historic dowsing and for current location to find where he lived. Michael added that information could be dowsed from a photograph. He said using the same skills it ought to be possible to plot the edges of a mine field and find terrorist “safe Houses”. He briefly mentioned how “watchers” could influence the the outcome of experiments. Heisenberg discovered this in the early 40’s. At this stage of his presentation most of the on lookers were starting to realise that the subject was not a micky mouse presentation. It helped when a Member of Staff (RE) recalled finding by rod dowsing a 500 lb bomb. In order to show the need for the mind to focus and not be diverted by the sub conscious he tasked the group to find a mills bomb on someone in their midst. In addition he showed us all how to search for hidden objects by combination of finger pointing and pendulum dowsing. He gave us very little time to complete the task which forced us to not allow the sub conscious to negate our dowsing. Of the many subject areas he covered one was the application of a Gigahertz scale to evaluate and compare a range of functions. 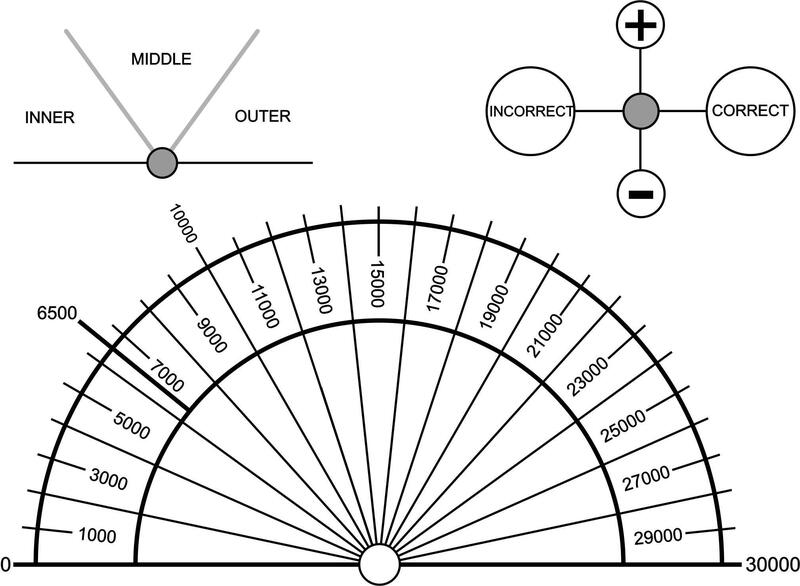 This is an example of the scale he was pioneering which is used in connection with directional/search mode dowsing. A task which some of the Group rose to was to evaluate three drafts for the lecture he was giving. The method was to directional dowse over the Scale above and ask the question before the presentation. The Method is to give a little momentum to the pendulum and allow it to swing to and fro over the scale. Then ask the dowsing question “what is the energy level of this object” – It will then oscillate over the Scale and quite quickly hover and settle on a graduation. That is your response. He added the following points concerning the use of the scale – measuring vulnerability prior to doing a security sweep – halting a patrol before they got to within range of an IED by dowsing scanning or map dowsing. Dowsing or the French term Radiesthesia is achieved by the operator picking up spirals of energy either given off or taken in. The spirals constitute a signature which are taken in by the dowsers brain, then, un-scrambled by the brain to create useable information. The energy is subtle energy and is in a spectrum of energy yet to be defined in lay terms. He has self published three books with one in French relating to dowsing and public policy and another on trees and public health policy in relation to subtle energies. His Bovis book which has some military relevance can be viewed on academia.edu He has been a Civilian Instructor with the Gordon’s School CCF for over 21 years. Sunday 11 November: The Power of Centre with Gary Biltcliffe. Gary and Caroline will introduce their exciting new book ‘The Power of Centre’. Following on from their groundbreaking work on the Belinus line, they have been continuing their spiritual travelogue of Albion and its earth mysteries. They have been focused on the exploration and research of the ancient navel or focal points of Britain and Ireland. They will discuss why ancient civilisations regarded geographical centres as spiritually important places. They will also reveal their connection with old and modern pilgrim routes, the healing potential within the land, and the worship of the Celtic Aquarian goddess Bride. Kay Kraty Therapeutic Properties of Sound will provide an introduction on the therapeutic properties of sound Kay will also talk about and demonstrate sound healing and the importance of using sound to bring about healing. Kay will explain the physics of sound related to the gong and provide experiential examples and exercises demonstrating sonic entrainment and finally ending with a short sound experience. Kay is a graduate of the Guildhall School of Music and Drama. Crystals and Life Symbols Cards and Books. Linda Prentice continues Waverley Dowsers season of practise and training with a talk and some practise on how to find water and how to discover the depth, flow and clarity of the water. depth,quality, quantity and mineral content of the water. dowsing for water, Pitfalls, tips, what to look for and record. Please arrive for 7.15 pm on friday 12th October as the talk will be starting at 7.30pm the venue will be the Waverley Dowsers normal meeting venue at the Unitarian hall, Godalming.